Some of you were asking about school and what I was taking this fall. I signed up for Yoga Teacher Training which starts next month. versus something you "think" looks or sounds right. And if any of you knew me, you'd know how much I love my Thrift Stores ! I love how they call Saint Vincent de Paul "Vinnie's" for short! ahhh that's awesome! I'm so excited for you! Life is an ever-changing journey and it's a long road with a lot of room to explore tons of things! btw-you're freaking gorgeous, I love that last picture of you! Love the pictures. Looks so quaint. Sounds like a great day if you ask me. I like that shirt actually. I don't think it's all that plain. It'd be super cute with white jeans too. Congrats on following your dreams. That's sooo important. I just got a scooter last week so scooter parking makes me like ANY place! looks like a fun day! First of all Congrats for your decision!!!!!!!!! I signed up to be a yoga teacher 3 months ago and it's amazing! Your shirt is beautiful and you look as I told you many times, gorgeous! You could be a model actually dear. You know that? Love that shirt! What a cute little town and how freaking exciting about the yoga! You are so right to follow your dreams! As for the thrift store! Heck yeah...I LOVE them! Cute top! You're too cute Kels! That looks like a perfect day! I love that town - it's so quaint! How long have you been studying yoga? If I ever visit your area after you get certified to teach, I'd definitely want to attend one of your classes. Cute striped tee. I love stuff like that. Scooter parking! How cute. I like that shirt on you -- it is simple but it looks good. That egg salad looks divine. That is awesome about Yoga Teacher Training. I've always wanted to do that but never had the time. I hope you love it. I'm sure you will! It looks like you had a great day. Cute shirt. Okay.. yeah, definitely weird that those people were gathering around and watching you. That's creepster territory right there. A good, solid tshirt is always a good purchase. Yay for following your dreams! I hope to go back to school for another degree someday. I'm happy that you are doing what you love! That's the only way to excel, I think! that's so exciting that you're doing yoga teacher training! yay! btw, thank you so much for the sweet comment on my last post. you're awesome!! HUGS FROM SC!! I am now craving egg salad! And that's awesome about the yoga teacher training. I would love to teach yoga someday!! I LOVE striped shirts and you know what? The one you bought looks fantastic on you!! You will be a great teacher as you have the right personality to go with it. How exciting! I definitely agree with following your passions! Now that i've just turned eighteen and am a legal adult, i'm jumping straight into my own photography business - even though going to university might be easier or seem "better"
One of my friends is a yoga instructor and she is so great! It is obvious how much she enjoys her profession and I am happy to be one of her students. :) Good luck with your certification and hurray for spending time with your mom. I love spending time with my mom and don't get to do it often enough. What gorgeous photos! And VIP parking for scooters???? LOVE IT! I love the shirt. It reminds me of the quintessential "french" look. So much fun!! I am SO excited for you to do your yoga teacher training! You will be amazing, such a rewarding job!!! I can not STAND when people stand around and watch you get your pic taken, it's my BIGGEST Pet Peeve!! I just don't get it? Like, WHY do you need to watch me, haven't you ever gotten your picture taken before? So weird, it makes me So uncomfortable! You are way too cute! I love that you spent the day with your mama... I am such a sucker for mother-daughter bonding time :P That sandwich looks SO good! I recently made an egg salad sandwich for the first time in ages and it was awesome! You could be a model, no joke. I like that striped tee. You know, I did A teacher training...but I got nothing out of what could have been worthwhile...especially for $4000 that's still on my credit card...:(...why?? Because my harasser, stalker, kept on me, making me feel bad for taking it, for "being able" to take it...hello!! I had to work full-time! I had(ve) to support myself! I had to put it on my credit - which is now $10,000 in debt...I didn't just magically "pay" for it!! Nor am I even teaching with it. Nor can I even do a simple pose because my knees are about my hips. Nor can I even TALK about it - because she still stalks my blog and is obsessed with me and making me feel bad for everything, everything, in my life. I can't just be me. Or just try to find out who i am. P.S Sidney totally reminds me of the East Coast!! 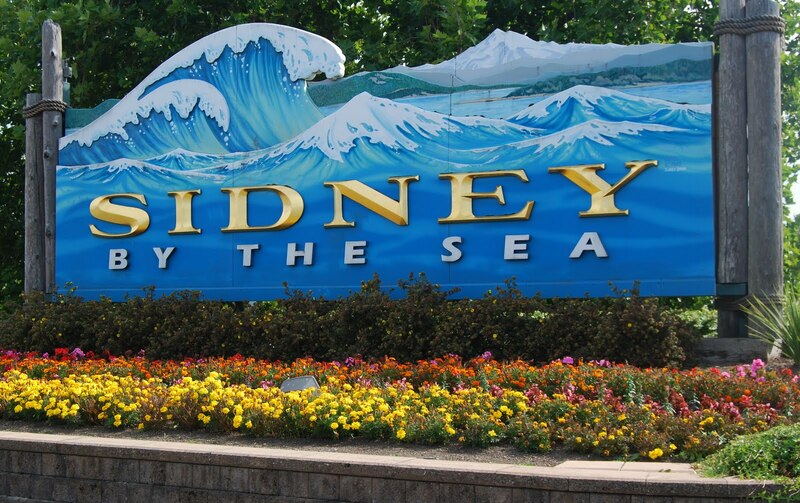 Sidney by the sea looks wonderful. I also feel like a creeper when people notice me taking blog photos - oh well! oh I forgot to say - you are going to be an AWESOME yoga teacher! good luck with your training. Congrats on your decision to pursue a yoga training teacher degree. Follow your heart lady, it can't do you wrong. I love striped t-shirts. I have SO many. What a beautiful town! I was actually thinking about taking a little vacation to victoria if I could this summer. I love towns like those. Looks like a fun day and such a cute, little town! Good luck with your degree...teaching yoga would be such fun! I love thrift stores too...we went to quite a few this morning and I found some awesome green shorts. And as everyone has said, you will be a great yoga teacher. I would totally take classes from you! I think you live in the most beautiful place I have ever seen Kelsey. I love how wholesome and clean everything seems and I think it would be a great place to raise a child. Definitely better than here anyway! Congrats on making the decision to change careers. It is never too late to pursue your dreams and I think you made a fantastic choice! This place looks absolutely gorgeous! It looks like such a cool little area with a lot of interesting places to visit. Love it! Also, I love that you are doing what is right for you right now. Sometimes we dive head first into a profession that we think will be a good fit for us, but it doesn't always end up being the case (or maybe we're not ready, or maybe it isn't a good time...) Whatever the case may be, we need to adapt to our situations and our preferences and do what will make us happy and be beneficial for us. I think it is amazing that you recognized this and are going after what you really want right now. Definitely follow your heart and do what is comfortable for you and makes you happy, cause after all, you are the one living your life. Best of luck with your yoga teacher training classes! Cute striped t-shirt! yay! yoga teacher training! I did my 200hr last year, now I'm doing my professional 300hr! where are you doing it? I did it with yoga works. Let me know if you have any questions about it. its a lot of info, but I think youll enjoy it! what a great new class to take! Oh my gosh, you are stunning! :) Very pretty photos. Just found your lovely blog and wanted to say hello! A coastal city with a cute cafe, health food stores, and good thrift stores? Sidney sounds like MY kind of city! Glad you had such a fun day with your mom! Wow, that is a fat egg salad sandwich! It looks so good..now I'm craving one! Congrats on deciding to do yoga teacher training..that sounds so fabulous, and I'm sure you'll do a great job. Sidney looks lovely. I would love to visit and eat at The Red Brick Cafe and visit thrift stores (!!!) with you! You are going to have so much fun at your yoga school! This is so exciting! lol I could see it in your face! "Smile, this is awkward..."
Congrats and goodluck in school I'm excited for youu. And seriously, be a model please. You're the prettiest thing. Love the shirt and love the scenery! Scooter parking... that's awesome! Hey Kelsey, thank you so much for your support, it wasnt easy to know my thyroid is whacked again but Im not giving up and depressing!! Thanks for all your lovely comments you reallymake me smile :) and your trip looks awesome. Love the pictures! Please come get me and take me to Sydney!!! And congrats on an awesome decision! I'm sure you will be an amazing yoga teacher!! Wow, yoga teacher training! That is so awesome. Following your heart will never lead you astray, I'm sure you are going to love every second of it! Can I join you and your mom on a trip to Sidney sometime?? It looks like such a quaint, cute town! Love places like that! Egg salad sandwiches have always been a favorite of mine. When I was little, I'd request one for my birthday dinner each year! congrats on the yoga training!!!!! i cant wait to read about it :) and that town looks so cute! your fam has the best weekend activities! What school are you going to? Did you sign up for a month long or an extended program? You are going to love it!! That top is soooooo cute. Whenever I buy something from a charity/vintage shop I love it so much more, I feel it has so much more feeling and expression and history, which makes it so much more interesting! Oh, and that comic about cyclists and the rain pretty much describes me, my brother said he would put it on my door! health food stores and thrift shopping - i love it! You are gorgeous girl!!!!! I love the pics in this post!